The biggest financial project of the BRICS grouping, the creation of a development bank may take around five years, Russia's Deputy Finance Minister Sergei Storchak told reporters in Moscow on Tuesday, February 25. He said the countries are yet to reach an agreement on the amount of funds each state will contribute to the bank's capital. Russia has called for the proposed development bank to have a capital of $100 billion and for each member to country an equal 20 percent, but other countries in the grouping suggested the amount depend on the size of each country's economy, according to Storchak. He added that once, the five countries come to an agreement, it will take around two years to complete all procedures and solve issues, and three more years to gather funds to build the bank's capital. “In the first two years we can save national budgets. Plus we bet that economic growth pace will improve so budgets will be better replenished and we will get a more favorable pattern for countries to be really engaged in the banks' operation,” Storchak was quoted as saying in the Russian Upper House of Parliament by the Wall Street Journal. The countries have also not agreed on the location of the bank, the Russian minister said. The establishment of a BRICS bank was first proposed in 2012 and approved at last year’s BRICS summit in South Africa. The single point objective of the grouping of for the creation if the bank is to put in place its own system of mutual lending and enable funding of big ticket developmental projects in the member countries and also help other nations to develop ties with BRICS. 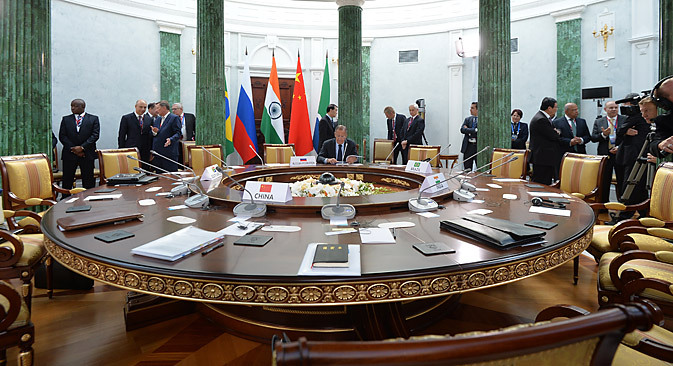 Those in strong support a BRICS bank believe it would allow the member countries to bypass the need for rushing to the Western-dominated and controlled Bretton Woods system which extends loans with conditions attached. Most often these conditions are not conducive to the socio-political climate of the targeted countries. After last year’s summit in Durban, Russian President Vladimir Putin said he backed the idea. “Russia supports the creation of the BRICS Development Bank. We believe that work will continue at the level of experts to work out operating rules for this financial institution,” he said after last year’s meetings. India is believed to have initiated the idea for the bank.